8 rounds + 1 @ 55# with step ups. Max sit ups during tabata = 13. Note: Do not eat Indian food before a workout. 7+11 @ 95#. Rx for jumps and wall balls. Felt good to be back after being knocked out last week with a cold. Fun, much-needed workout after holiday feasting. 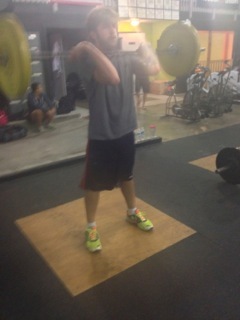 11 sets of: 35# kb swings, box jump, push up. First time doing 24″ box jumps! Heaviest weight I have done in a while!